All SeaScape Golf & Beach Villas Resort 2 bedroom, 2 bathroom lodging units accommodate 6 people. The master bedroom has a queen bed and the guest bedroom has 2 twin beds. The living room has a full Murphy wall bed, which disappears into the wall when not in use. All holiday rental accommodations have a fully equipped kitchen, with an extensive inventory of supplies, a deck with chairs, two cable TVs, DVD player, stereo, iron and ironing board, and free wireless WiFi internet access service. Linens and towels are provided in the unit for the week, but the resort does not offer mid-week changes of linen. Condos do not have washer and dryers, but we do have free laundry facilities onsite. Initial supplies of toilet tissue, paper towels, trash bags, bath soap, coffee filters, dish washing liquid, and dishwasher detergent are also provided. Each unit has a dining area with table for 4 people and a breakfast bar area that also seats 4 people. This 950 square foot condo vacation rental offers relaxing views from the patio. Click here to check availability or to rent your Seascape Golf & Beach Villas Resort Kitty Hawk week. We also offer condo vacation rental weeks at Barrier Island Station’s Duck and Kitty Hawk Resorts, click here to check availability. SeaScape is located about a quarter mile from the beach. Public beach access points, with limited parking areas, are available all along Highway 12. NONE AT THIS TIME. Consider this resort instead. All rentals are $899 total price including tax and cleaning. Check-in day is Sunday. 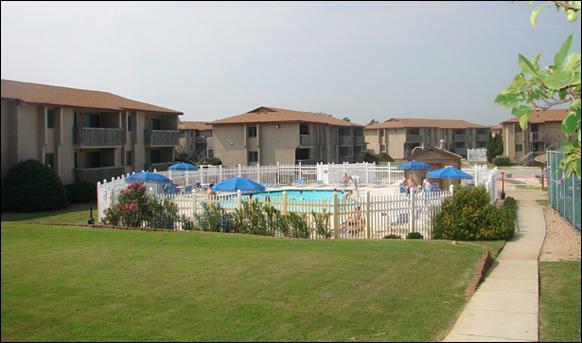 Compare our great price to the resort-offered rate of $1175 per week (source = resort website). Please click here to check availability or pay for your week. The prices shown are the TOTAL prices. There are NO additional charges (such as sales or lodging taxes, cleaning fees, deposits, booking fees, etc.). The price you see is the price you pay! Instead, your payment is handled discretely and securely by PayPal, which is an eBay company. If you are already a PayPal member, you are familiar with the benefits of using PayPal to buy on the Internet. If you don’t have a PayPal account, that’s alright, you don’t need one! PayPal’s secure system allows you to use any major credit card to make your payment. There is no cost to you for using PayPal, and by using a credit card, your purchase is protected and your peace of mind assured. So, go ahead, click here and get your week! View a map of the property layout and amenities here. To find out more about area attractions please visit the Outer Banks of North Carolina Visitor’s website.